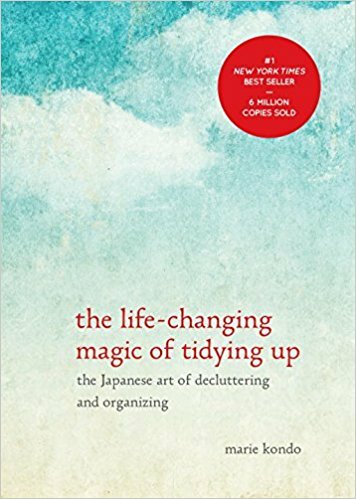 If you've been following me on social media, then you know I've been more than enthusiastic about the book, "The Life-Changing Magic of Tidying". Marie Kondo takes tidying to a whole new level with her system of decluttering, by using the category method than by room, or the little by little approach. Which has made this method "KonMari" probably the most effective way of tidying up once and for all. But as I began reading this book, it was more than just about tidying. She asks really hard questions, that takes time to evaluate your heart and what you really want in life. I think this is one of the reasons why I love this book and method so much, because she helps you see clearly the areas in your life where you have been making excuses upon excuses to not change your habits. One of the reasons our homes are the way they are is because of our past experiences and our fear of the future, by facing your past and saying good bye, you not only get freed up but you can also confront your future with arms wide open and not cowering with fear of the unknowns. 1.) Direct, and to the point (no BS nonsense). 2.) She shares her life experiences, which feels a lot less intimidating. 3.) The method works! She give tons of testimonies of people who were boarder line hoarders and NONE of them have relapse. 4.) She helps you see the things you've been hanging onto in your life that don't bring you joy. 5.) She helps you get clarity and vision for what kind of lifestyle you want to live and come home to. 6.) You learn the difference between "tidying" and "decluttering"
7.) You become more happier when you come home to a tidy house. 9.) You learn more about yourself, your likes and dislikes. 10.) You lose nothing! You only gain a better understanding of yourself, and are given tools to make changes within your home. 1.) Although she talks about some spiritual things that I don't agree with, I can still respect her, and follow most of the steps she has laid out for tidying. So when you get to some of the parts where it gets little weird just skip it, it's OK. I don't think it will really make or break the tidying process. 2A.) The only other con I have for this, is that I think you have to have outside help. Meaning if you're really going to tackle this, you need at least a good 2 full days to go through this process. Or be committed to tackling a category everyday after you get off work until everything is completed. I am mostly speaking to single folk regarding this. 2B.) As for families and stay at home mommas reading this, now that I have gone through the process, I wish I would of been able to go through it closer to her method of category by category. What I did, was I went through each room, and then broke it down category by category. This is because when you have a little one or little one(s) tackling a category based on the whole house can be daunting and I am unsure it can be done when you are a stay at home mom. That being said, I would recommend having the kids stay with Grandma and Grandpa over a weekend and you and your husband tackle the whole house together. There is still a good chance you won't get everything done, but I am pretty sure you could get at least 50% completed, and then try again the following week. If you don't have family in town, I would recommend having a couple of close friends come over and help you with the decluttering process and/or help watch your kids so you can get a few categories completed. Here are some links to check out to start your KonMari journey! Happy tidying! At first I would of been one of those people that said 2016 was the worse, and yes 2016 was not the greatest year for me, but now looking back, the Lord was in every single moment, in every single breath, in every single thing that I did or did not do. He was everywhere, and for most of last year I chose not to believe in that. I chose to lean on my own strength, to put myself above my family, my friends, and God. You know what happened? I crashed. Hard. I had a seizure, in October, my weight and eating habits were terrible, my emotional state was in disarray, and I was very seriously going to walk away from my marriage, my family, my business, my life, and from the Lord. So yes, last year was a very hard year for me on every single level. But you know what, after I had my seizure, I actually began to see things clearly. I thought at first and maybe it's still true that I had the seizure because of the devil, because of the constant warfare over my life, and that might have played a part in it, but when I looked at the bigger picture, and when the doctor told me I couldn't drive for six months, I had the biggest weight lift off of me. I was glad I couldn't drive! I was glad that I had to stay home with my son and look him in the face and be his mom! It was like the Lord was telling me STOP! Just stop Andrea! You are literally killing yourself and you are allowing the enemy the drive that knife a little deeper, you are allowing him to push you a little harder. I saw a picture of myself in that moment me at the fork in the road. Which path will you choose I heard, and what I saw was path that looked nice but at the very end it changed into death. Then I saw the other path that didn't look to awesome either lol, it was narrow and baron, but somehow I knew deep in my heart that fruit would come forth if I chose that path. I took a deep breath, reached out my hand to no one at the time, but then looked up and there He was, waiting and smiling at me, and I chose the road less traveled. So the past couple of months the Lord has taught me a few things. To slow the heck down, take a deep breath, and be in the moment; yet look toward the future for He has good things in store for me then I can ever imagine. I just need to trust that He knows what He's doing. That I am not missing anything, everything in His timing is the best timing. Pride and Prejudice. One of the most iconic stories ever told by Jane Austen. I've been wanting to read the classics since, like forever, but since getting married having a baby blah blah blah life has been consuming. My good friend recommended Audible which is a website dedicated to audiobooks. They have thousands of books available, and amazing performers reading the books. This is my second audio book and I really enjoyed it. At first it took me a while to get into the story, but I think it's because I listened to Jane Eyre first, and that story is a dark, redemptive book. So going from that to a book to a very light hearted novel, threw me off a little. But eventually I got into the story and was swept away by all the crazy and beautifully written characters. I was not disappointed with this book, and I highly recommend it especially for the times we are in today.